The new findings are an extension of previous work by the same research team, which found that Zika mainly targets specialized stem cells that give rise to neurons in the brain’s outer layer, the cortex. 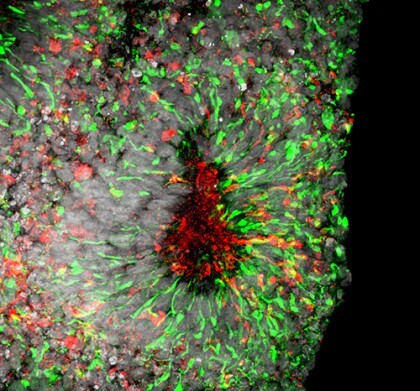 The researchers observed Zika’s effects in two- and three-dimensional cell cultures called “mini-brains,” which share structures with the human brain and allow researchers to study the effects of Zika in a more accurate model for human infection. Typically, after Zika infection, the damage done to neural cells is “dramatic and irreversible,” says Hengli Tang, professor of biological sciences at Florida State University. However, some of the compounds tested allowed the cells to survive longer and, in some cases, fully recover from infections. Song cautioned that the three drugs “are very effective against Zika in the dish, but we don’t know if they can work in humans in the same way.” For example, he says, although niclosamide can safely treat parasites in the human gastrointestinal tract, scientists have not yet determined if the drug can even penetrate the central nervous system of adults or a fetus inside a carrier’s womb to treat the brain cells targeted by Zika.